Based on a true story from King Humayun’s reign, which is destined to leave you amused. Nizam Sakka, an ordinary person, saves the life of Humayun during a fight off between Sher Shah Suri and Humayun. In return, King Humayun grants Nizam Sakka one wish. 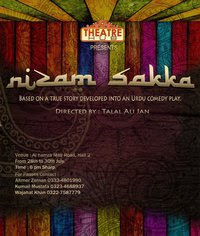 Nizam Sakka asks to become the King of the subcontinent, and Humayun bestows Nizam Sakka with the kingship of the subcontinent for one day. What follows..is a comical masterpiece! Gates close at 6pm sharp!